Welcome to “Milestone Monday” or #MSM here on Drama for Real! Every first Monday of the month, we’re going to be posting our rankings, or milestones if you will, for various aspects of all the dramas we’ve watched. These rankings are going to range from the very serious, e.g. the ultimate OTP (one true pairing) couples, to the pretty silly, e.g. worst hairstyles. We’re starting off our #MSM series with something that can either make or break a drama: OSTs and songs. Who amongst us hasn’t hummed our favorite theme songs randomly during the day? So, grab a glass of water and clear your throat, and get ready for a little drama singalong! ANNA: Romance in the Rain/Qing Shen Shen Yu Meng Meng (C) – It was initially a toss up between this entire soundtrack and the one for Princess Returning Pearl/Huan Zhu Ge Ge, but I just couldn’t deny how memorable each one of the songs for this drama was. These songs would sound just as nice for a modern or historical drama as they did for the WWII era of QSSYMM. Classic! ESTELLE: Love Rain by Jang Geun Suk from Love Rain (K) – Props to this song because I barely finished two episodes of this series, but totally went and purchased this song on iTunes. That says a lot. ANNA: The Rooftop (TW-film) – For a Jay Chou musical, having only 2 original songs sung by him is completely unacceptable. I am Jay’s #1 fan, and even I can’t get over how terrible this whole OST is. ESTELLE: I can’t think of any, but that’s probably because they were so bad I blocked them all out already. ANNA: Forever Forever/”Yong Yuan Yong Yuan” by Li Yi Jun from Wind and Cloud (TW) – I still love it now as much as I did when I first heard it 12 years ago, and it makes for a pretty epic karaoke session while driving. If all my music was deleted from my computer, this would be one of the first songs I need back in my collection. ESTELLE: Hidden Fragrance/”An Xiang” by Sha Bao Liang from The Story of a Noble Family (C) – I literally took a recorder to the TV because I had no other access to this song. Still as good as ever, and I can listen to it for forever. 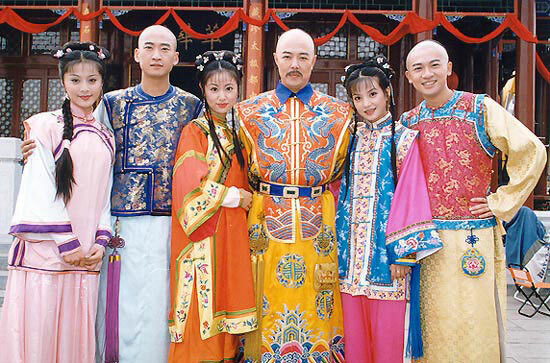 ANNA: Wind and Cloud by Jiang De Sheng from Wind and Cloud (TW) – As much as I loved the ending theme, “Forever Forever,” for this drama, I hated the opening theme. A wuxia drama with a guitar rock song with English lyrics. Yeah, no. ESTELLE: Sing with me~~~ I concur, that was not a good song. ANNA: Every Moment of You by Sung Si Kyung from My Love from Another Star (K) – It was played during all the angsty and heartwrenching moments between Do Min-joon and Cheon Song-yi, and never fails to make me picture all those sad scenes in my head/tear up a little bit. Sad Do Min-joon = Sad Anna. ESTELLE: One Persistent Thought by Hu Ge & Alan from Bu Bu Jing Xin/Scarlet Heart (C) – With well written bittersweet lines, how can you not feel sorry for the fated love story that can cross centuries of time, but is still doomed from the beginning? No matter how beautiful their love is, it will always remain a beautiful mistake, and that breaks the heart. ANNA: Paradise by T-Max from Boys Over Flowers (K) – Is there a song that is more closely linked to a drama than this one? It’s actually quite an annoying song, but I can’t help but sing that “almost paradiiiise” line whenever BOF is mentioned. And yup, that’s the only line I know. ESTELLE: The ones that I wanted to get out probably already left. Hehe. ANNA: Red Butterfly/”Hung Wu Dip” by Ron Ng from Rosy Business (HK) – I’ve listened to this song countless times, but have yet to master the poetry-like lyrics. That’s not going to stop me from mumbling along to it though! Check out the cover by the lead actor, Wayne Lai, for the Rosy Business “sequel,” No Regrets. ESTELLE: Promise by A.N.JELL from You’re Beautiful (K) – Ok, they are not a real band but I wish they are because I would happily buy their CDs, even though all I can sing is “I will promise you” and “I love you forever~~~” Yes, yes I will. ANNA: Let Me Love You/”Rang Wo Ai Ni” by Vic Zhou & Barbie Hsu from Mars (TW) – While the song is not your typical bouncy and happy tw-drama song, its lyrics really tell the story of how in love they are. I’m still a Jerry-Barbie shipper from Meteor Garden though, sorry Vic. ESTELLE: Cunning Thoughts/Sly Imagination by Sunny Hill from Cunning Single Lady (K) – I love how this song completely captures the bouncy, cute and fun tone of this whole series. Read our review and watch the show? ANNA: Good Times/”Hao Shi Guang” by Wallace Huo & Della Ding from Perfect Couple (C) – A wonderfully cheerful theme song that was literally on repeat on my iTunes, and is my #1 played song. I love this song so much that I don’t even skip the opening theme part when I’m watching the drama because I want to listen to the song. ANNA: Can’t Help Falling in Love/”Qing Fei De Yi” by Harlem Yu from Meteor Garden (TW) – Harlem is a well-established singer and is no one-hit wonder himself, but if Harlem decides to stop recording any new songs and just sings this one forever, that’s fine by me. Here’s Lee Min-ho aka Mr. Goo Jun-pyo in the Korean adaptation of Boys Over Flowers, singing the Korean version of Can’t Help Falling in Love. Worlds colliding! ANNA: When/”Dang” by Power Station from Princess Returning Pearl/Huan Zhu Ge Ge (C) – HZGG is my all-time favorite drama, so it’s only fitting that its original theme song is also my favorite drama song. I will forever love this song, and will gladly listen to it on repeat (along with the rest of the HZGG soundtrack) for years to come. ESTELLE: New Butterfly Dream/“Xing Yuan Yan Hu Die Meng” by Huang An from Justice Bao (C) – This is a true classic. I sing this in shower, every single word, no joke. What are some of your favorites? Or perhaps a least likeable song you remember? Tell us below! i bought the rooftop ost cd as collection because its on sale..but even after a week i haven’t open the wrapping it yet.. none of the ost makes me wants to listen to it..
i love ISWAK ost so much. its really ‘on repeat’ track. !! nowadays im addicted to ‘happy me’ by lil kim, download it after i rewatch reply 1994 a few weeks ago. Yeah…that Jay Chou “Rooftop” movie was not good at all. I literally remember nothing from the movie or the OST besides the fact that it was terrible lol.